Item #: SAM81224. 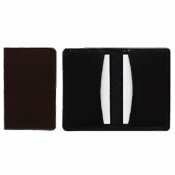 Business card cases feature genuine cowhide leather covers. Top stitched with two pockets and black designer lining.